The Emotions, Donald Byrd, WAR, Lenny Williams, Frontline Orchestra and more. Through the alcoholic haze, I think this is pretty much the set I played on Jamie McGreal&apos;s London Soul Cruise on 2 December 2012. It ranges from a few classic weekender classics, boogie gems and into some re-edits and soulful house. 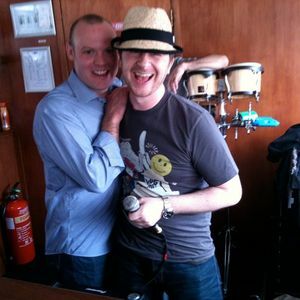 The photo is from an earlier soul cruise of me and top bloke Super DJ Luke McCarty who always plays a fantastic House set on the boat. I love Breakin&apos; Down too and I really like how John Morales has just toughened it up a bit. Wow - &apos;Breakin&apos; Down&apos; is the one! Thanks Jamie - Fonzi Thornton is amazing - the Yam Who? version or the unreleased OG.